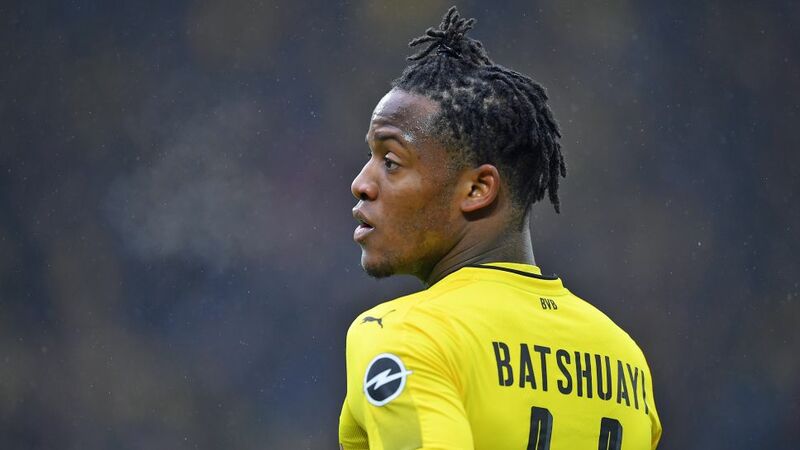 Michy Batshuayi says he would love to see Usain Bolt make it as a professional footballer, as long as the retired sprint star doesn't take his place as Borussia Dortmund's leading man. Bolt - the Jamaican 100 metres and 200 metres world-record holder - enjoyed an eye-catching trial with Dortmund last month, and has made no secret of his wish to carve out a career in football. "It's a shame I wasn't there, but I've seen the videos," Batshuayi told Belgian media. "He did nutmegs and scored a good goal. He's a champion. He pushes himself beyond his limits every day. He wants to beat all the records. He's trying to establish himself in another sport, that's classy. "I'm happy for him, but I hope he doesn't come and take my place," he said with a smile. Joking aside, Dortmund are hardly in a hurry to see Batshuayi leave. The Belgium international has been a roaring success since being brought in on a six-month loan deal from English Premier League side Chelsea on 1 February 2018 as a replacement for Pierre-Emerick Aubameyang, scoring seven goals in nine Bundesliga outings. "I came to Dortmund because I needed playing time in order to find myself," Batshuayi told French football magazine Onze Mundial recently. "There were a lot of offers, but with Dortmund everything was wrapped up very quickly. I'm psyched up right now because I spent a year and a half on the bench before. People are starting to see Michy again and it feels good."